OAU Peeps News Agency can confirm that a student named Oluwalade Babatunde of Department of English,Faculty of Arts,OAU has been suspended indefinitely from the university community.. Mr Oluwalade Babatunde Popularly known as BabaTee and also the Chairman, Transport Management Commission of Great Ife Students Union received his letter of suspension in the late hours of today Wednesday,October 11,2017.. In the letter obtained by the agency tagged "" Suspension from the University Pending Police Investigation of Your Criminal Activities "", report received by the Vice Chancellor as stated by a part of the letter states "" On October 6th,2017 at 8:55am or thereabout, with some persons violently disrupted the academics and extracurricular activities of the University by forcefully chasing other students from Lecture halls under the guise of protesting an alleged unsatisfactory power supply to the campus. 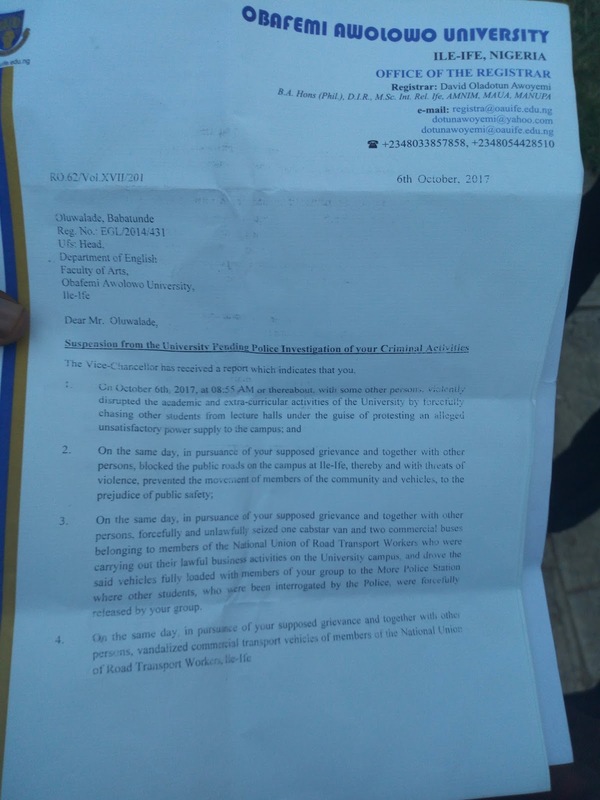 The Vice Chancellor has therefore ordered that you should be suspended from the University in the interim,pending Police Investigations and until such time as the situation shall have been reviewed and resolved """. Speaking with the University Public Relations Officer,Mr. Abiodun Olanrewaju , He said "" the university has done what deem fit right"". The University Registrar ,Mr Dotun Awoyemi also on a chat with the news agency responded to the belief of students that a student has to face panel before suspension.. He clarified that the University Vice Chancellor can suspend any student without facing any panel pending investigation to ensure discipline. 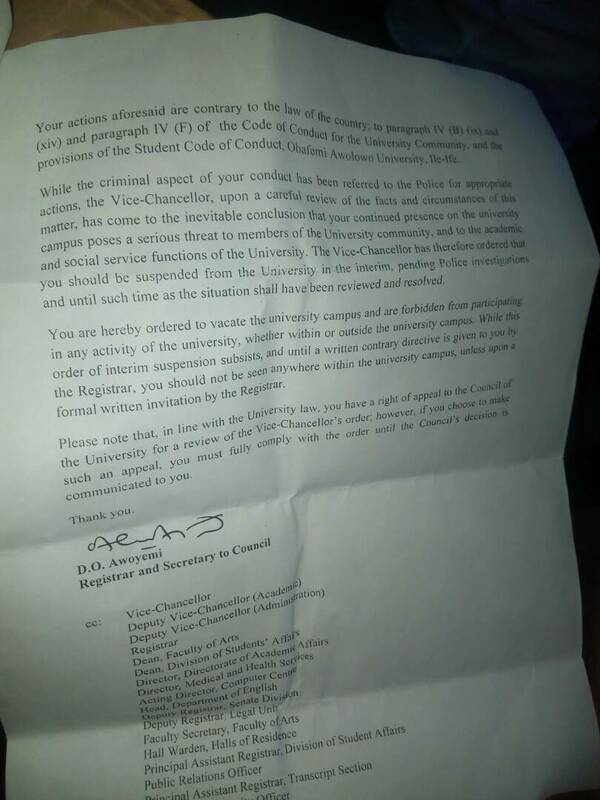 A Part of the letter further reads"" You are hereby ordered to vacate the university campus and are forbidden from participating in any activity of the university, whether within or outside the university campus. 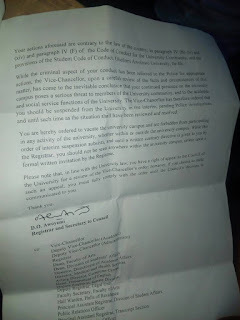 While the order of interim suspension subsists and until a written contrary directive is given to you by the Registrar, you should not be seen anywhere within the university campus,unless upon a formal written by the Registrar.."""
The Students Union President, Oyekan Ibukun (Dr. IBK) in a release has however called for solidarity stating that the University Management has taken it too far by suspending some of our gallant and vibrant comrades for no known cause but what was cooked up to victimize him. "This we fully stand against as a union. ", He further stated..